It’s kiwi time, and the race is on. Each September as our Hardy kiwis (Actinidia arguta) start to ripen, we begin a delicate balancing act, deciding exactly when to harvest. We want them soft, ripe and sweet, but if we wait too long, many will vanish in the night. Most of the year we love sharing our property with raccoons, pileated woodpeckers, red squirrels and all the other delightful two and four-legged creatures that live here or visit seasonally. But at kiwi time, we’re a little less charitable. Steller’s jays arrived about a week ago, and over the last couple of days I’ve seen then staking out the kiwi vines – so we’d best get moving fast. 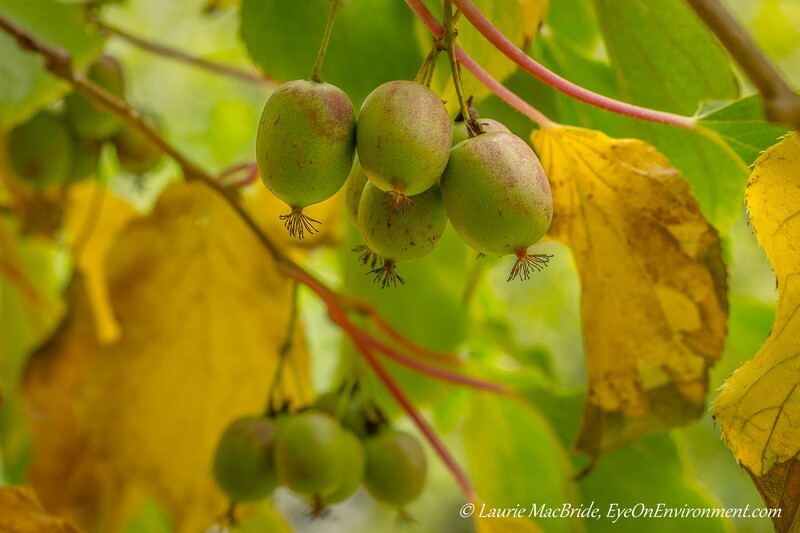 Posted by Laurie MacBride, Eye on Environment on September 19, 2014 in Garden and tagged animal behavior, fall, food gardening, fruit, Gabriola, harvest, homegrown, kiwis, nature, photos. Is this the same type of Kiwi that you see in stores? They sure look much smaller. I bet you wouldn’t want your crop eaten by critters. They are different than the kiwis sold commercially. You’re right, they’re a lot smaller. Also, the skins are edible so no peeling is needed. But they taste much the same. Thanks for the comment, Ida. Wow! That’s a lot of kiwis! I’ve never had kiwi wine. It sounds delicious. We certainly think it’s delicious! Thanks for commenting, Robin. You’ve gotta real harvest there! how long after you plant vines do you get fruit? I’d like to try. I’m not really sure, Paul. When we moved in the vines were already producing – the folks who lived at our place previously planted them, perhaps five or more years before we moved in. We’ve been here 13 years now and the vines are going strong. If you google “hardy kiwi” or “Actinidia arguta” you’ll get lots of info about them. They are different than regular kiwis and well suited to wine-making, as they don’t need peeling like the bigger kiwis do. Fifty to sixty pounds? Yes, you better get going! 😉 I had a kiwi vine but never saw any fruit. I think I was missing the male….